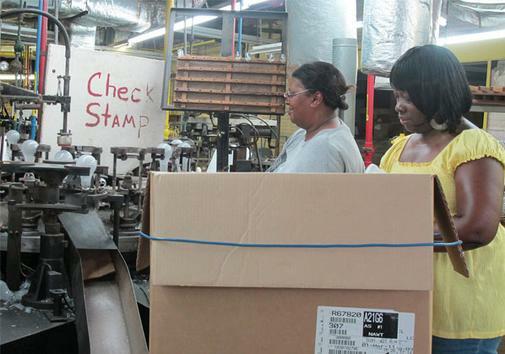 Loretta Grice and Jessie Williams were among 14 employees producing more than 9,000 incandescent bulbs a day during 2011 at the American Light Bulb Manufacturing Co, Mullins SC. As mentioned earlier, apart from the Missouri meeting there was also a South Carolina meeting today on the H.3735 bill (bill summary). It was a sub-committee meeting, and a full Senate committee meeting is due to follow after being held over from last year, having awaited the result of the Congress deliberations on the federal ban, as well covered on this blog. The South Carolina (SC) bill is perhaps the most interesting of the outstanding local state bills. Firstly, because the bill is far advanced, passed in House 76-20, now in Senate where Republicans have a majority (27 of 46 seats), so if it passes committee would probably go through to the Governor for signing. Secondly, because SC has the bulb manufacturing, and it's a small independent outfit, less subject to major manufacturer and federal pressures. The American Light Bulb Co in Mullins SC made the simple incandescents right up to 2012 and are "fired up" against the ban, as also covered in a previous post on American incandescent light bulb manufacturing. While I have not confirmed the details, there is a certain irony of a special hearing sought by an environmental group seemingly waking up the Committee to perhaps go ahead and pass the slumbering bill! An environmental group wants South Carolina senators to reject a bill meant to trump federal energy standards for light bulbs. The proposal passed by the House last year would allow South Carolina manufacturers to make and sell traditional incandescent bulbs only in the state. It's in response to a federal law requiring 100-watt bulbs to be more energy efficient. Ryan Black of the Coastal Conservation League told a Senate panel on Wednesday that the bill circumvents federal efforts to promote innovation and save electricity. He says some new incandescent bulbs meet the efficiency standard. Sen. Kevin Bryant says the government shouldn't tell residents what kind of light bulb they can buy. No action was taken. Bryant's subcommittee advanced the bill last year. It is awaiting debate in full committee. The Incandescent Light Bulb Freedom Act passed by members of the S.C. House of Representatives on April 14 not only takes a stand against a forced phasing-in of compact florescent bulbs, but also instills confidence in a Mullins manufacturer fighting to stay in business. American Light Bulb Manufacturing Co. owner Ray Schlosser said the company is the only independent incandescent light bulb manufacturer in the state. He said the proposed state law will keep his business competitive. The bill passed by the S.C. House would allow American Light Bulb Manufacturing Co. to produce and sell within the state, stamping them “Made in South Carolina.” The Senate has yet to vote on the bill sponsored by Rep. Bill Sandifer. Sandifer, a Seneca Republican, said states’ rights would prevail in the argument that the federal government only has the power to regulate commerce between states. The stance is in reference to the 10th amendment of the Constitution, “The powers not delegated to the United States by the Constitution, nor prohibited by it to the States, are reserved to the States respectively, or to the people.” The bill states the General Assembly finds that if an item manufactured in the state without inclusion of any significant parts imported from another state and the item is offered for sale and sold only for use within the borders, the item is not in the stream of interstate commerce. American Light Bulb Manufacturing Co. has been operating in Mullins for the past 10 years. With a staff of 14 people, the majority of the workers have vast experience working in an industry that has been in place for more than four decades. The light bulb manufacturing industry took shape in the form of Marvel Lamp in 1963 followed by Supreme Lighting Co., which was later sold to SLI, Inc. in 1999. The plant later announced a shutdown in November 2000. More than 300 workers lost their jobs as a result. “A federal ban on incandescent bulbs would be detrimental to the manufacturing business and result in more job losses”, Schlosser said. Plant manager Carolyn Roberts said the facility experienced layoffs a year ago, but now business appears to be picking up. “We have a large customer base and we usually produce up to 9,000 bulbs per day,” Roberts said. Workers also package and distribute the bulbs after several rounds of testing, she said. Raw materials used to make bulbs include glass, brass for the base and tungsten wire. Workers assemble the bulbs operating machines that use multiple flame sources, fixating the filament on a glass stem, fusing it to the bulb. The air is later pumped out of the bulb and sealed by fire before inserted into a brass lamp base and then tested. Schlosser said he is excited about being the lone manufacturer in the state. Eighty percent of all bulbs are imported from mainly from China, he said, and an American presence in the bulb-making industry should remain. Schlosser said Sandifer’s bill will level the playing field by sustaining a company in the state despite a large number of imported light bulbs being distributed throughout the country.